#Heathrow13 | Plane Stupid - bringing the aviation industry back down to earth! Thank you to all who attended the sentencing on Weds 24 February! On January 25th, Justice Wright found the 13 activists who occupied Heathrow Airport in July 2015 guilty of aggravated trespass and being unlawfully airside. In doing so she rejected their claim to a necessity defence – to prevent serious injury or death – and told them to expect "custodial sentences" at their sentencing hearing. On February 24, Justice Wright sentenced the #Heathrow13 activists to 6 weeks prison, suspended for 12 months, 120-180 hours community service and £500-£1000 costs. Photos of the sentencing demo and hearing will appear as they come in. Photos of the #Heathrow13 in a group, their individual portraits, the trial and action. The Heathrow13 are on trial for occupying Heathrow's northern runway last July. The occupation, which was the first on a Heathrow runway, lasted six hours and delayed or cancelled dozens of flights. The activists, who are all pleading not guilty, are accused of aggravated trespass and being airside without authority. The defendants argue that their action was necessary due to the airport's contribution to life-threatening climatic changes. Furthermore, Heathrow expansion is inhumane to the local residents and those at the sharp end of climate change, and hugely environmentally destructive. The fact that it’s still being considered at all is a testament to the superiority of corporate lobbying over democracy and scientific evidence. The government continues to promise to deal with climate change, most recently at the COP in Paris and in wellies in Cumbria, whilst continuing to make it worse and hoping no-one puts two and two together. 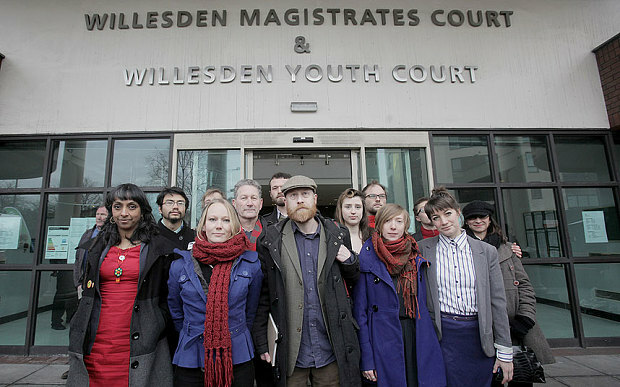 The thirteen activists, all facing possible prison sentences, have watched the continuous parade of lies and broken promises from Heathrow and successive governments, and realised that no amount of scientific evidence will be enough to make them stay within the law or safe emission limits, and citizens need to stand up against the lobbying power of major industries before it’s too late. When the Prime Minister is set to break a ‘no ifs, no buts’ pre-election and manifesto pledge, civil disobedience is needed to uphold democracy. The runway occupation is what democracy looks like. See Twitter for updates on the trial. Graham Thompson, 42, from Romford in Essex, is a long-term climate activist and co-founded Plane Stupid in 2005. He works in the press office for Greenpeace UK and has also volunteered for various other climate campaign groups including No Dash for Gas and Campaign against Climate Change. He lives with his girlfriend in Clapton, London. This was his third runway occupation, and he has eleven previous convictions for peaceful protest. Danielle Paffard, 28, grew up underneath the Heathrow flight path in Richmond. She has a degree in Biological Science from Oxford, and has been campaigning on climate and social justice issues since graduating in 2009. She founded the ethical finance organisation Move Your Money, and currently works for global climate campaigning organisation 350.org, running the Fossil Free Divestment campaign. She lives in Whitechapel, London. Ella Gilbert, 23, is an aspiring climate scientist who recently graduated with a masters in Climate Change from UEA. She is particularly interested in atmospheric dynamics and circulation in the polar regions. She has been involved in climate, environmental and social justice campaigning for over a decade, and is originally from Finsbury Park. "The climate science is undeniable and we need swift action from our government. However, despite making promises to cut emissions following the recent Paris climate summit, and despite their legally binding commitments enshrined in the 2008 Climate Change Act, the government is promoting airport expansion. If we're at a crossroads between averting a climate crisis and blundering into a dark and unknown future, then the road to airport expansion is definitely the path that leads over the cliff." Sam Sender, 23, has spent his whole life in west London under the Heathrow flight path, including two years in the Heathrow Villages earmarked for a third runway. He lives in London, works as a gardener and has been campaigning on Heathrow expansion since 2012. "We are the first generation with a clear understanding of climate change and the last with time to stop it." Alistair Tamlit, 27, has degrees in Geography (Bsc) and International Development and Management (Msc.). He is passionate about tackling the structural inequalities that dominate our world. He works with grassroots groups to build alternative ways of living. "I took part in this action in solidarity with frontline communities around the world. It is primarily black and brown, poor communities and women who are affected by climate chaos; these are the people who have suffered at the hands of colonialism for centuries and have done least to cause climate change. It is the responsiblity of the relatively privildged to take the necessary steps to minimise climate chaos." Rebecca Sanderson, 28, grew up in Acton under the Heathrow flight path. She has an MA in Psychology and Philosophy and works as a social scientist. She contributed to the research behind Fellow Travellers, the Frequent Flyer Levy campaign, and is focused on psychological aspects of inaction on climate change. Dr. Rob Basto, 67 from Reigate Surrey, studied physics at University College London and carried out research into the Earth’s atmosphere in the 1970s. He has been campaigning on climate change related issues for the last 15 years. He has been active with both local and national environmental groups and has also been involved with the campaign against fracking. "Action on mitigating climate change has been too little and too slow. We are now in a very dangerous situation where we have failed to take adequate preventative measures and urgent and decisive action is now needed to prevent irreversible catastrophic changes to the climate." Kara Moses, 32, is from Birmingham but is currently living in Machynlleth, Wales. She holds a BSc degree in Biological Sciences (Environmental) from Birmingham University and an MRes in Primatology from Roehampton University, London. She has published papers on primate ecology and co-written books on primates and tropical islands facing environmental destruction. She currently works in outdoor education with children, as an environment journalist, environment editor for Red Pepper magazine, and sustainable water treatment manager. She has volunteered, worked and campaigned on environmental issues from a young age. "The science is clear – it’s new runways or a safe climate, we can’t have both. This new runway is to serve a wealthy minority of frequent flyers, the 10-15% of the UK population that last year took 70% of UK flights, while 57% didn’t fly at all. While they live luxury lifestyles, airport emissions cause climate chaos and air pollution that kills. If trying to stop climate change is a crime then we are guilty, and we're prepared to go to prison for that. But when the government prioritises profit and luxury flying habits over the lives of so many people affected by climate change, you have to ask who the real criminals here are." Melanie Strickland, 32, from London, has a degree in English and Philosophy, and has done further studies in law. She works at a health charity. She's been campaigning on climate change for the last 10 years. She's also a community activist and volunteers at a community food project. "When the political system is so fundamentally flawed that it is unresponsive to an issue of colossal international importance, such as climate change, then every citizen has a responsibility to act. There is a basic human, moral and social duty to take action to prevent this disaster and to wake people up.' "
Edward, a resident of Sipson in the Heathrow villages, organises with local group Transition Heathrow, delivering a programme of community outreach and education, working closely with neighbours in the campaign against a 3rd runway at Heathrow Airport. Sheila Menon, 44, from London, is a filmmaker and environmental campaigner. She has been working on a range of climate-related issues for the last 5 years, both on a local and global level. She volunteers for a variety of environmental and social justice campaign groups, both at NGO and grassroots level. She has a BSc degree in Maths & Business Management from Kings College London. Cameron Kaye, 23, has been campaigning for action on climate change and a halt to aviation expansion since he was 15. He is a local resident of Sipson and works with local and grassroots groups to campaign against the third runway. He has a BSc in sustainable Development. After studying he moved into Sipson to be on the front line of taking action on climate change though campaigning and finding alternative ways of living. Richard Hawkins, 32, lives on the edge of the Snowdonia National Park in Wales and has a degree in Law, specialising in International Environmental Law. He works for an independent research centre focusing on climate change, energy and economics. He has worked with international climate scientists helping them better communicate their research and is a big fan of science, democracy and the Arsenal.